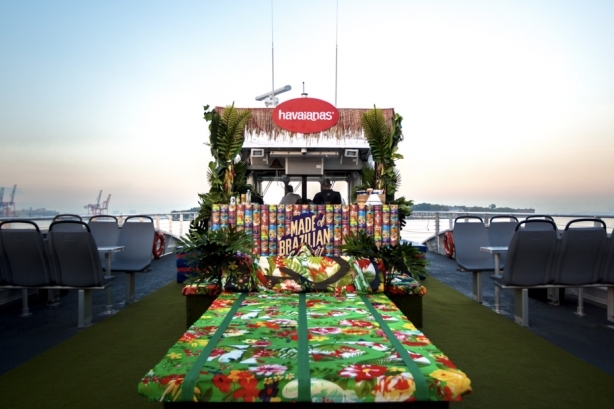 The ferry featured Brazilian-themed décor, a cash bar, authentic Brazilian snacks, and a Havaianas pop-up shop. A ferry that runs between Manhattan and Rockaway Beach has been transporting riders to Rio de Janeiro during the hour-long journey. Planning for the campaign began in June 2017. Havaianas partnered with New Stand, a series of boutique retail shops that offers brand partnership opportunities for companies to outfit each location with logos and messaging. In addition to several shops across New York City, New Stand recently signed a six-year contract with Hornblower Cruises & Events to bring refreshment-type stores to the ferries across New York City. This campaign would be the first brand takeover of one of the ferries. "The goals were to engage with New Yorkers on their way to the beach either after work or on the weekend at the height of summer and transport them to Brazil," said Inhwa Lee, director of marketing at Havaianas. The campaign team developed the hashtag #RiotoRockaways to amplify the activation and encourage social media engagement. To help facilitate the success of the activation, New Stand enlisted staffing support from Radikel and production support from Replica. Alison Brod PR handled press and media outreach for the campaign. The #RioToRockaways ferry activation ran from August 3-7. Havaianas used branded social channels to help amplify the launch for consumers. The brand and its agency partners ensured that the activation would fit into the operational aspects of the ferry itself. "The biggest thing was just to design the build-out to where it would still work for commuters, have it approved by Coast Guard, and make sure the build was safe," explained Andrew Deitchman, CEO and cofounder of New Stand. The ferry itself featured a cash bar, authentic Brazilian snacks, and Havaianas flip-flops available for purchase. Riders were also encouraged to share pictures of themselves on the ferry using the campaign hashtag for a chance to win a free Havaianas mini bag. "We created signage with our #RiotoRockaways hashtag and had a brand ambassador onsite engaging with consumers, taking their photos, and handing out prizes for social currency," added Lee. In terms of media outreach, the campaign team targeted marketing, advertising, and trade publications, as well as some fashion and footwear publications. The hashtag #RioToRockaways generated hundreds of posts on social channels, including more than 200 posts on Instagram alone. During the activation, ridership on the ferry was double what the campaign team had anticipated. In addition, sales of Havaianas products are showing strong results due to the campaign. Though New Stand does not share exact sales data, the ferry with the Havaianas activation generated almost double the revenue compared to any other ferry in the Hornblower fleet during the week of the campaign. Agency and brand reps were unable to elaborate on results.